Look out for a special Easter fundraising coffee morning in Tarbert. 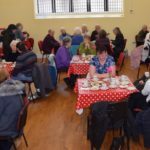 Expect delicious home-baking and plenty chat as Tarbert Church of Scotland and Free Church of Scotland join forces for the event on Saturday April 20. Templar Hall is the venue and the coffee morning will be open between 10.30am and 1pm.